Collectible MBTA Green Line trolley car, a Boston, Massachusetts icon and part of America’s first subway made of die cast metal. With moveable wheels and front and back couplers. Whether you grew up with the Green Line trolley in Boston or rode along its storied path during your visit, owning this one-of-a-kind collectible version of the iconic trolley is the ideal way to make those memories last. The Green Line trolley cars run through America's first subway, the Tremont Street subway in downtown Boston. It travels both underground and above ground as it passes Boston landmarks including Fenway Park, the Museum of Fine Arts, Symphony Hall, and Boston Common. 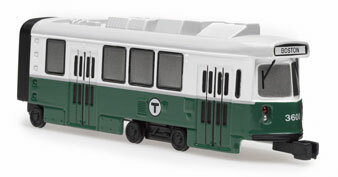 This die-cast metal toy represents the MBTA's "Type 7" light rail vehicle. The Green Line is a light rail system run by the Massachusetts Bay Transportation Authority (MBTA) in the Boston, Massachusetts metropolitan area. It is the oldest Boston subway line, which is known locally as the 'T'. It runs underground downtown and on the surface in outlying areas. With a daily weekday ridership of 221,900, it is the most heavily-used light rail line in the country. Officially licensed by the MBTA. Dimensions: 5.0"L x 1.77" H x 1.18"W. Not for children under 3 years.